SUSSEX COUNTY, NJ – Recently, Crew 276 attended the annual Area 5 Rendezvous and had a great time. Crew 276 previously attended the 2013 “Medieval” themed Rendezvous and the 2014 “Dr. Who” themed Rendezvous. When we arrived on Friday we signed in, set up our campsite and headed up to the dining hall for a snack and a shooting safety briefing. 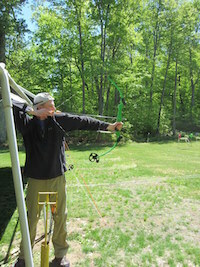 Crew Advisor Andrew Joiner at the archery range. Image courtesy of Venturing Crew 276. Saturday morning we woke up and headed to colors for the morning flag ceremony and announcements. After breakfast the scouts headed out to their first station. My first station was also my favorite one; pistol shooting! When we got to the range we had the opportunity to shoot Mark II Rugers and some revolvers. A great surprise was that one of the Range Safety Officers (RSO) brought in his WWII era M1 Garand for us to shoot! The M1 Garand is my favorite WWII rifle and is an iconic firearm that was a crucial part of WWII. Other morning stations included archery, riddle solving, candy making and giant Jenga. The riddles station was very fun and also a challenge. At candy making, we made green colored root beer flavored lollipops which we got to eat. 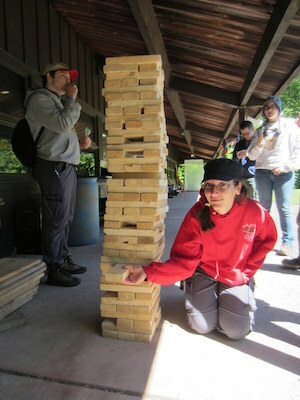 Crew Vice President of Administration Katie Rozek playing giant Jenga. Image courtesy of Venturing Crew 276. After lunch, many crew members participated in the “Color Run”. The color run is an event where some participants run the course and other are stationed along the course to soak you with colored water and chalk. Afternoon stations included chemistry which was both fun and educational. We learned many different ways to make soda from using dry ice to using baking soda and vinegar. After we made our soda, we got to drink it! We also got to do the Mentos / Diet Coke geyser experiment. The afternoon also included mini golf, wood branding, gaga ball, Frisbee and rock climbing. 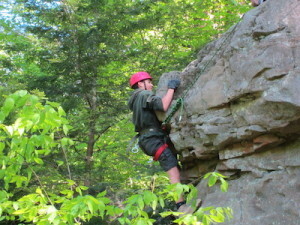 Rock climbing was on a natural rock face which was more challenging than an artificial rock wall. Crew Vice President of Public Relations Stephen Rozek climbing the rock wall. Image courtesy of Venturing Crew 276. After dinner there was more Frisbee and other games. At the end of the evening, we headed down to the campfire. Our crew participated by performing songs and skits. Overall, this was another great event hosted by Northeast Region Area 5 Venturing and one of my favorite events throughout the year. Venturing is a youth development program of the Boy Scouts of America for young men and women who are 14 through 20 years of age. Venturing Crew 276 meets monthly in Byram Township at the Lakeland Emergency Squad building. More information on the crew can be found at venturecrew276.com.